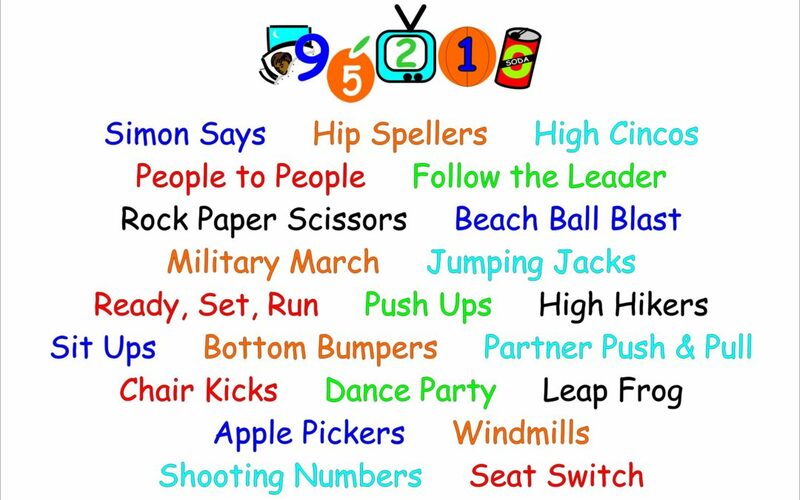 The following is a list of movement breaks teachers can use during the school day. These movement breaks are not meant to replace daily recess or physical education classes. These movement breaks are to be used to provide students with quick movement breaks through out the school day. High Cincos: Students jump up to give a partner “high” high five, and then switch to a new partner. Beach Ball Blast: Throw 2-3 beach balls into the room and have the students work together to keep them up. Partner Push & Pull: Students pick a partner. Partners sit down, facing each other, legs straight and open, and bottoms of feet touching partner’s feet. Partners stretch by gently pushing and pulling. Dance Party: Turn on a song and dance! Apple Pickers: Students bend down and jump up with arms up as if they are reaching for apples on a high branch. Shooting Numbers: Choose a number to skip count by, such as 3. Choose a student to count from 1-100. The rest of the class bends their knees with their hands touching the floor. As the student counts, they jump up and “shoot a goal” every 3rd number that’s counted. Hip Spellers: Students choose a partner. Without speaking, students use their hips to spell a word from the class spelling list. Partners take turns “spelling” and guessing. People to People: Choose a student to call out body parts, such as “hip to elbow, knee to chin, foot to hand…” Students match body parts to a classmate’s body parts. Military March: Students march with straight arms swinging as straight legs kick up. Ready, Set, Run: Students run in place. High Hikers: Students jog in place with high knees. Bottom Bumpers: Students jog in place, kicking their bottoms with their heels. Chair Kicks: Students stand in front of their chairs, and practice kicking over their chair. Leap Frog: Students squat down on knees with hands held open in front of them, and take three low leaps forward and then three low leaps back. Repeat. Windmills: Students stand with straight arms and legs spread open. Students cross their bodies as they touch their toes. Students can practice skip counting while doing windmills. Seat Switch: Teacher calls out “seat switch.” Students quickly find a new seat to sit in. Repeat 4-5 times.